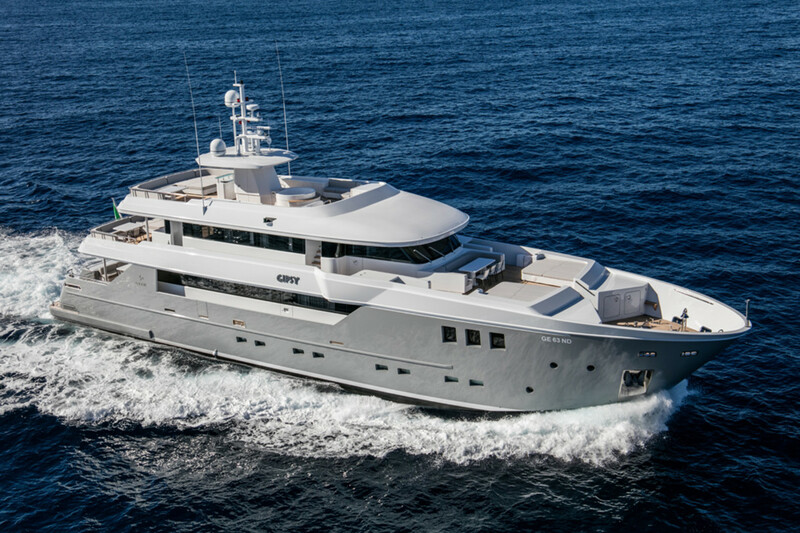 Otam debuted its first new 115-foot Custom Range, M/Y Gipsy, at the Sept. 28-Oct. 1 Monaco Yacht Show. Otam said the new Custom Range 35 has a top speed of 20 knots and a range of more than 2,000 nautical miles at 11 knots. The builder said the three-deck yacht, which has a 25-foot beam, was ordered by an experienced Italian owner who was searching for a full custom aluminum yacht. Otam said the semidisplacement hull gives the Otam Custom Range 35 a top speed of 20 knots and a range of more than 2,000 nautical miles at 11 knots. Large spaces available in the yacht include a nearly 430-square-foot main salon with a movie theater and a full beam dining area forward. The main deck also hosts the service areas, with a fully furnished galley and a 269-square-foot pantry with separate access for the crew. Four VIP cabins with twin and double beds and relative ensuite baths are on the lower deck in an area connected by a hallway to the crew&apos;s quarters.